When it comes to pellet grills, Traeger are king. Joe Traeger invented this new type of grill back in 1986, and they remain the top selling brand of pellet grill to this day. A new Traeger grill is a major investment, so it’s important for you to do your research before you decide to pull the trigger. Especially in 2019 when there are lots of brands making excellent quality pellet grills. In this detailed guide we review the best Traeger pellet grills, explain the differences between each option and see how they stack up against the competition. Shopping for a Traeger grill can be very confusing. With so many years in business you’ve got a lot of different models and versions to compare. 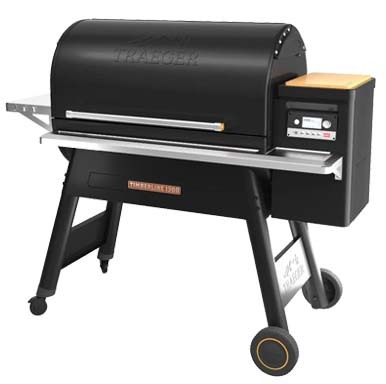 These days Traeger produce 4 main lines of grill, plus a handful of other popular models including the Bronson, Renegade Elite and Junior Elite. You need to decide between buying the latest model with all the latest bells and whistles, or trying to get a deal on slightly outdated stock. 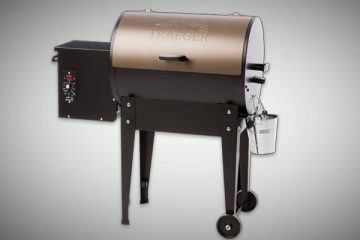 At the time of writing this Amazon seems to be stocking a bunch of the older Traeger Grills, so we’ve put links to the new models on BBQGuys.com. Traeger Pro series – The most popular mid-range option now includes Wi-Fi connectivity to the Traeger app for all 2019 models. Traeger Ironwood Series – A step up from the Pro series, offering slightly larger sizes plus some funky new tech known as DownDraft Exhaust and TRU convection to help optimize cook times. You also get Super Smoke mode, the option to push a button and ramp up the smoke production. Traeger Timberline series – The largest and most expensive option, choose between 850 or 1300 square inches of cooking space. You get all the features of the Ironwood plus pellet sensing tech that lets you monitor your pellet levels on the app. 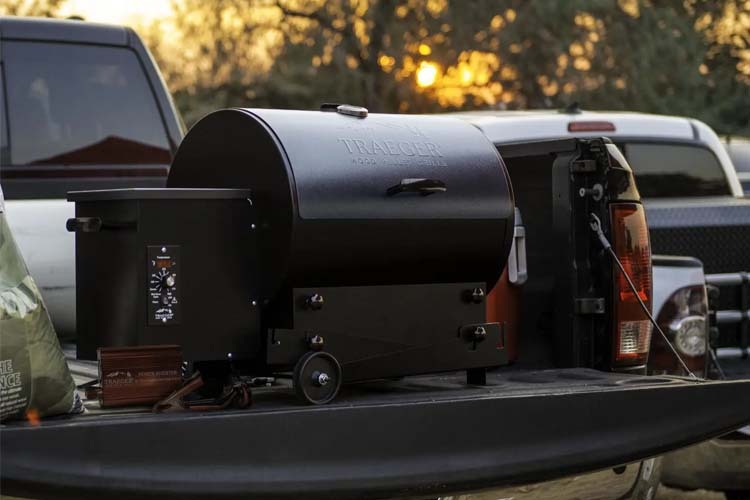 Traeger Tailgater – As the name implies this is the portable model, with 300 sq inches and a lot less tech. 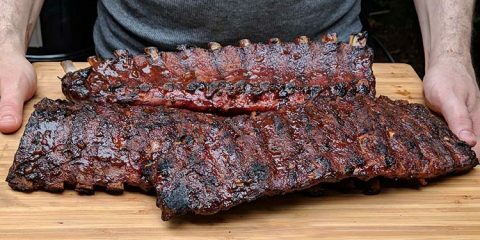 For all 2019 models, the number in Traeger’s product name refers to the cooking surface, so the Pro 780 has 780 square inches of cooking surface. For older models the number refers to the size of the main grilling rack. E.g. the Pro Series 34 has a 34″ x 19″ grilling rack. To help you decide which Traeger grills is best for you, we have reviewed our picks for the best models. This chart is also very useful for comparing between different Traeger models. 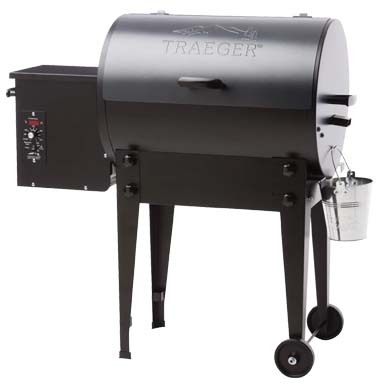 The Traeger Pro is the most popular and best selling Treager grill. It comes in two sizes. The 575 square inch model has enough space to cook 5 racks of ribs at once, or 4 chickens which should be plenty for most people. You can also choose between black or bronze color. The big change in 2019 is the addition of Wifi technology to the Pro lineup. This ‘WiFIRE’ feature lets you connect your grill to the Traeger companion app, and control it from anywhere you have internet connection. Temperature is controlled by the Pro D2 direct drive controller which lets you cook anywhere between 180 – 450°F. The RTD probe measures the temperature every second to maintain even temperatures within 15 degrees. Another benefit of the D2 direct drive technology is the turbo temp fast start up which lets you start cooking quickly. Take a look at this video to see the Pro 575 getting fired up. You get an 18lb hopper, and thanks to the clean out feature you can quicly change pellet flavor during a cook. In terms of efficency the grill will go through about 2 lbs of pellets per hour on high heat, and only 1/2 lb per hour on smoke mode. If you are having trouble deciding between the Pro 575 and the Pro 780, Traeger has a handy comparison guide. One last thing to consider is that the Pro Series has a max temperature of 450°F so this wouldn’t be the best option if you want to do a lot of searing. Get the latest price on BBQGuys.com (Free Shipping). 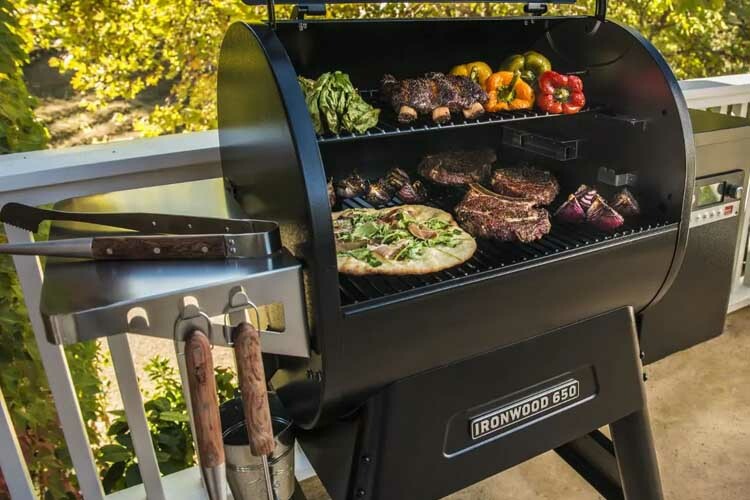 The Ironwood series is a new addition to the Traeger lineup of pellet grills. Available in either 650 or 885 square inches you get a larger, more versatile grill than the pro series, without the large price jump you see on the the Timberline series. Having said that even the smaller 650 square inch Ironwood is over the $1,000 mark so this is definitely not a budget grill. Design wise the Ironwood is similar to the more expensive Timberland. You get the ‘DownDraft Exhaust’ and ‘TRU Convection’ features that used to be unique to the Timberland. While it does sound a bit like marketing jargon, these features promise to help circulate fresh smoke, keeping smoke in the chamber and maintaining even temp. All things that we like to hear. You’ve also got some handy features that make this grill easy to use. Like the keep warm mode and options to create custom cook settings via the digital control panel or app. Option for searing – The bottom cooking grate can be lowered for searing, or raised for grilling and smoking. Better insulation – The Ironwood uses double side 304 stainless steel for better insulation and temperature control. The Ironwood series is all about offering a middle range between the pricier Timberline and smaller more basic Pro series. The Timberline represents the latest and greatest from Traeger, and it’s got a price point to match. When the Timberline series was launched back in 2017 it used to have a few more unique features. This year some of these have made their way down to the cheaper Traeger models so it’s not quite as impressive as it used to be. But there are still some notable improvements. As well as offering an absolutely whopping 1300 square inches of cooking space, the Timberline is the only Traeger model to include a pellet sensor. This handy feature monitors your pellet consumption, and lets you check on your phone so you don’t have to worry about pellets running out. While this shouldn’t happen to often, especially if you remember to fill the 24lb hopper. It’s still a really handy that you don’t have to worry about running out mid cook and restarting everything. You get three removable grill grates that can be positioned for searing or smoking. The Tailgater is Traegers attempt to offer the convenience and flavor of cooking with pellets, in a portable format. With 300 square inches of cooking space, the Tailgater should still be able to handle 3 racks of ribs or up to 2 whole chickens. The grill weighs 62 lbs and measure 36 x 37 x 18 inches. The pellet hopper can hold 8 lbs which should allow 4-6 hours of cooking without refilling. The EZ-Fold legs are handy feature which allows you to wheel the grill onto the bed or your truck. What you gain in portability you give up in features. The Tailgater doesn’t include WiFi or any of the other improvements in the Pro, Ironwood or Timberline grills. Having said that, this grill still performs well and can handle anywhere from 180 – 450 °F.The digital elite controller keeps temperatures fairly stable within 20 degrees of your set temperature. While there’s something nice about grilling with charcoal when you are camping, you can’t beat the versatility of pellet grill. Being able to bake, grill and smoke is super convenient when you can only take one grill with you. 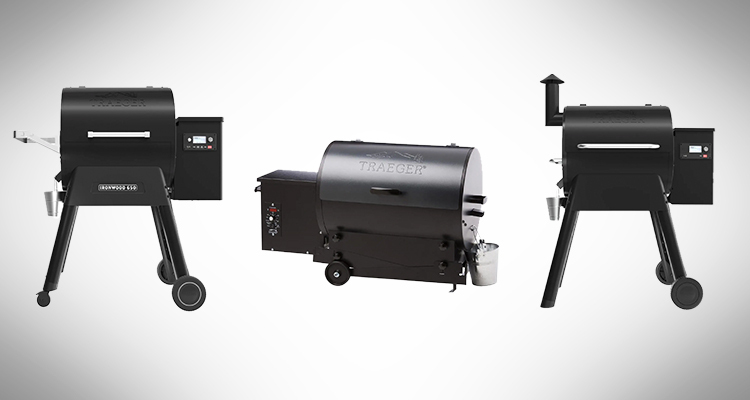 The four grills above represent the most popular Traeger’s available today. But there are lots of other models, and some of these can definitely be worth picking up if you can get them at a discount. 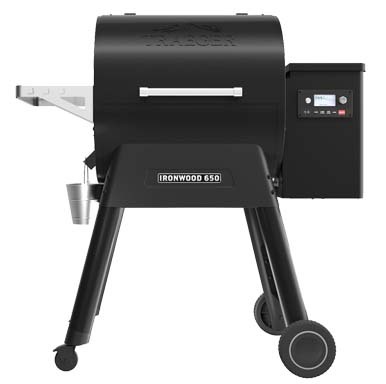 Traeger Renegade Elite – This grill is slightly larger than the Bronson, and slightly smaller than the newer Pro 575. It’s an a nice little grill, but the problem is it’s currently only slightly cheaper than the much more modern Pro 575. The tool caddy rack and wire front prep rack are both nice features. If you can get it on special definitely worth considering. 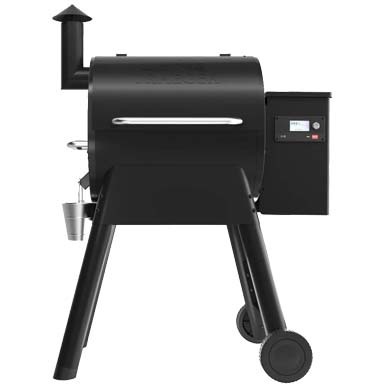 Traeger Bronson 20″ Pellet Grill – With 300 square inches of cooking space, the Bronson is a similar size to the Tailgater. While the all terrain wheels make transportation easier, you don’t get the easy folding legs. The Bronson is more suited to smaller families. Traeger Junior Elite – This little grill is starting to show its age. With the same 300 square inches as the Bronson, it’s actually older and less sturdy. Still OK value on special, but if you get a choice you are better off going with the Bronson. Thanks to the popularity of wood fired pellet grills, there are now many more brands to choose from. While Traeger is still the most popular, these brands are definitely hot on their tails. I’ve tried to provide a general overview of how each brand compares with Traeger, but because each brand produce many different grills if you need specifics I would suggest comparing individual specs from the manufacturers and then looking at a few different reviews. I’m a big fan of Camp Chef, and their popular PG 24 Deluxe is currently our top pick for best overall pellet grill for most people. They also sell the larger WoodWind Classic which is also very good. Unlike Traeger, Camp Chef produce a variety of outdoor cooking products and other types of grill, so they definitely aren’t as specialised. The option to purchase a sear box with Camp Chef is really nice, since even a top of the line Traeger can’t get quite hot enough for searing. Camp Chef has a really nice system to dump and switch pellets. Traeger are definitely more expensive, and come with more technology. 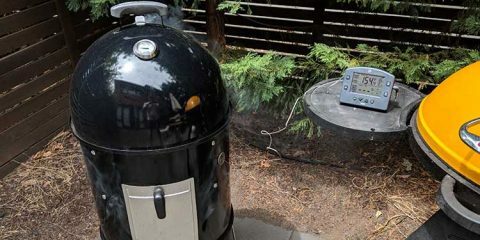 If WiFi connectivity is important for you then you should go with the Traeger. Green Mountain Grills (GMG for short) have been gaining a lot of popularity since they launched in 2008. They were ahead of the game when it comes to including WiFi as standard option with their pellet grills. No other brand offers WiFi at this low price point. Well built and competitively priced, they are a strong alternative to Traeger. A lot of their fame comes from the excellent Davy Crockett grill, which we named our best portable pellet smoker. 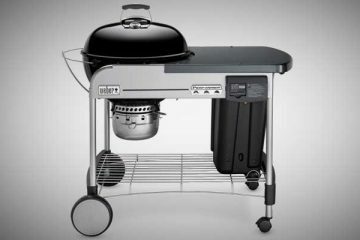 This grill competes with the Traeger Tailgater, but with the GMG you get WiFi which is really handy when you are camping. If you aren’t interested in a portable grill, they also sell the popular Daniel Boone model which has 468 square inches of cooking space. For the price Green Mountain Grills make an excellent Traeger alternative. You just don’t have the full range of features and sizes available. Pit Boss is part of a larger company called Dansons that also make the popular Louisiana grills. 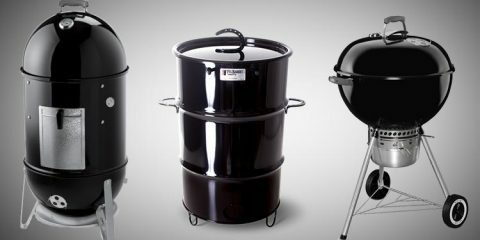 The Pit Boss line of pellet grills is their attempt to take on Traeger by offering very similar grills at a lower price point. Pit Boss sell a large range of grills, starting from the the entry level Pit Boss 440 Deluxe and going all the way up to the Austin XL with 930 square inches of grill area. One unique feature on the Pit Boss is the way they handle searing. A small plate slides to open and shut access to the firepot. Unfortunately the flame from the firepot doesn’t provide enough heat for great searing. On the upside you can hit temps as high as 500°F which is a full 50°F higher than on the Traeger Pro. Pit Boss only offer a one year limited warranty. And that doesn’t include the burn pot. You get a more generous 3 year warranty with the Traeger. Build quality is pretty similar to Traeger, so it comes down to how much you value the warranty. Z Grills are the newest competitor to Traeger. While it looks like they appeared out of nowhere, they’ve actually been manufacturing grills out of China for other companies (potentially including Traeger) for a number of years. The main advantage of Z Grills is value for money. The Z Grills 7002 2019 model offers 700 square inches of cooking space, a 3 year warranty and similar construction quality to Traeger, all for a significantly lower price. They also have a smaller 450 square inch model that has similar construction. After some people reported issues with the temperature control unit, this has been upgraded in the latest 2019 models. Z Grills are a good choice if you don’t mind buying from a relatively unknown brand without a lot of customer service history. With so many models and brands available, deciding which model to buy can be intimidating. But finding the best grill is all about weighing up your needs. I find it helpful to think about a few different factors when buying a new grill. The Pellet grills we’ve looked at in this guide range from 300 – 1300 square ft. An easy way to narrow your search down is to work out how big you want to go. Generally the larger you go, the more expensive the grill will get. Although a large grill from a budget brand like Z Grills will still cost less than a more premium brand like Traeger. If you go too small you won’t be able to cook enough food to feed all your guests. But if you go too big you’re grill will cost more to run and you’ll waste some pellets. You also need to think about size of the pellet hopper. The larger the hopper the longer you can cook without re-filing it. My recommendation is to choose a grill slightly larger than you think you’ll need. Some people like to have all the latest tech on their grills, while others prefer to invest all their budget in a grill that focuses on superior build quality. Have a think about which features are nice to have, and which are non-negotiable. WiFi connectivity – Do you want the ability to control your pellet grill from your mobile phone? Searing ability – Pellet grills make great smokers and ovens, but can struggle to sear. Lots of manufacturers include a searing attachment, or come up with a clever way to achieve higher temperatures. Portability – Do you need a light weight grill with legs that will fold up ? Think about if you will ever need to take this grill on the road. Every factor we’ve talked about contributes to the price. Pellet grills have more tech in them, and generally cost more than other types of smoker. I would recommend a starting budget of $400. From there you can go all the way up to $2,000 for the largest state of the art Traeger. I always like to know a little bit about the brand of grill I’m buying. And Traeger has quite an interesting brand story. Traeger grills was the result of Joe Traeger and Jerry Whitfield experimenting with wood pellet burning stoves. Joe Traeger was the first person to develop the pellet grill in 1985 and he patented it in 1986. Thanks to this patent, Traeger had the pellet grill market all to themselves for the next twenty years. Early Traeger grills used a simple LMH controller which let you choose between low, medium and high heat. These early models were fairly basic, as the auger timing didn’t allow for weather conditions or the amount of food being cooked. During this time Traeger remained a small family company based out of Oregon. When the original patent expired in 2006, there was a rush of new brands entering the pellet smoker market. By 2014 there were 27 different companies manufacturing pellet grills. Jeremy Andrus joined Traeger in 2014 when he acquired the business in with private equity firm Trilantic Capital Partners and moved the business to Salt Lake City. Today Traeger is still the largest manufacturer of pellet grills, selling more than $300 million worth of product per year. For many years if you wanted a pellet grill Traeger was the only option you had. With the rush of companies entering the market, Traeger have had to seriously up their game. With the release of their 2019 models, Traeger offer some of the most advanced pellet grills available in terms of technology. Having said that, as a big company they do spend a lot on marketing and you can definitely get good value deals on some of the other brands like Camp Chef or Green Mountain Grills. We suggest you shop around and look at a few different models before you pull the trigger.